My goal with this little bit of lace was to use one skein of yarn, making this a very affordable knit. My stitch patterns are based on two Estonian Lace Stitches, a version of Liblikakiri (butterfly) and a half-drop leaf stitch. Neither one is quite the same as the original, but both are instantly recognizable. 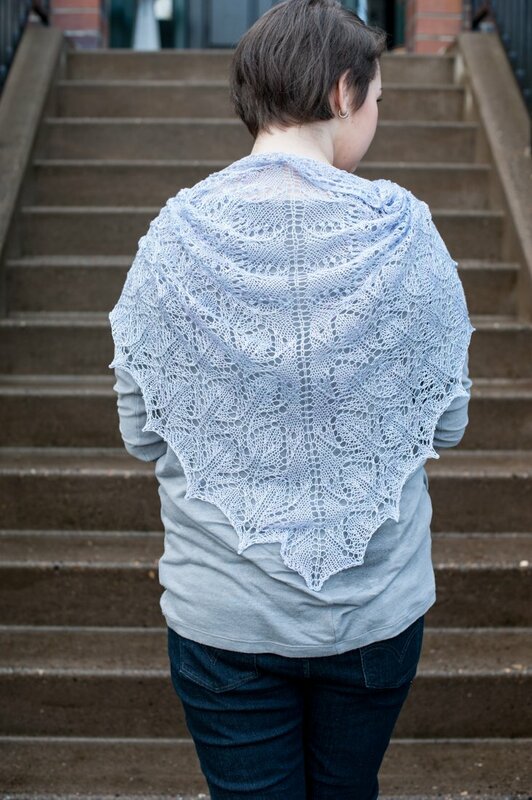 This shawl is knit from the top down, employs nupps on the wrong side, and is easily adjustable. The first and second charts contain the same number of stitches in the repeat, allowing the knitter to increase or decrease the size of the shawl as the yarn allows. This pattern is meant for a more experienced mid-level knitter as the chart involves nupps and patterning on both sides. Two different methods for working nupps are included. This shawl comes in 2 sizes, a short size and the pictured long size. Both written and charted instructions are included in the pattern.